I’ve been lucky enough to chance across a series of excellent cookbooks lately, all of which share a similar quality. They’re not just about food. Food might be their reason for existing, but this clutch of books have more, they have a feeling about them, a feeling that the author has got under the skin of the cuisine they describe, understood where the food came from and why it’s the way it is. They’ve understood the cultural context of the recipes they write. This is the difference between a mediocre collection of recipes, and a cookbook that manages to talk to the heart and soul of the food it describes. Momofuku is one such book, as is Thai Street Food. 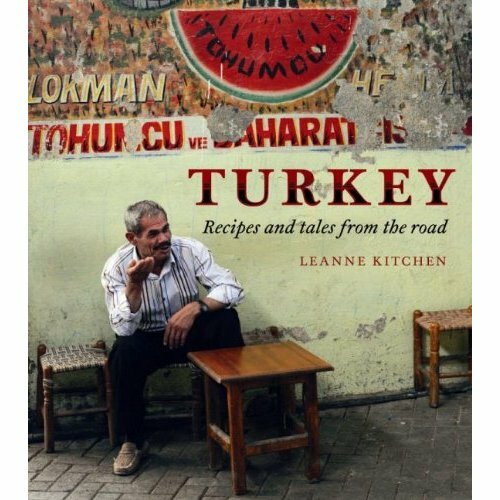 by Leanne Kitchen, an inspirational and detailed look at Turkey’s rich and varied culinary heritage. It’s easy to slip into lazy writing and use the word ‘evocative’, but there is a sense here that Kitchen succeeds in bringing Turkish cuisine to life, of joining the dots between Turkish food, culture and the reader. This is an important point, and one that many food writers miss completely. To be truly successful, the writer has to help the reader understand why, not just what and how, but why those particular ingredients are important, why that technique is vital, why that dish is so important to those people. It’s only with that understanding that the reader and the cook can hope to feel the spirit of the food, to cook it in the way that it deserves to be cooked. For a masterclass in this sort of writing, you could do worse than flicking through The Book of Jewish Food by Claudia Roden, or indeed, anything else that Roden has committed to print. So, Kitchen’s book is part cookbook, part travelogue, part photo essay. It has that size and heft to it that’s fashionable now among food writers, who perhaps hope their books move from the kitchen shelf to the coffee table. Most don’t manage that short journey, but Turkey is easily capable of such a move. Kitchen notes in her introduction that Turkish food isn’t homogenous, nor could the food of a country that borders eight starkly different nations and whose main river has long been regarded as the very border between the East and the West ever be. As a primer on Turkey’s rich and colourful food heritage, this book is a triumph. Much of Turkey’s food is really quite easy to cook, and there’s much here that the average home cook can achieve easily. That isn’t to say that Turkish food lacks complexity – it doesn’t – but it is accessible, and there’s plenty here to try, laid out in clear and incisive recipes. The fact that Kitchen is an Australian, resident of Sydney doesn’t hinder her in her travels and discoveries. There’s a school of thought that would argue that the only people who can truly show the essence of a regional cuisine are people from that region. I disagree. I think that passion and commitment are as important as heritage, and sometimes, the outsider looking in is at a distinct advantage, able to observe and evaluate without preconception. Turkey is one of those rare cookbooks, one that succeeds at a technical level, it’s a book you can certainly cook from, but also at a deeper level as a complete and engrossing work. It’s a book to be read, enjoyed, used. How strange, I was thumbing through the Turkey book yesterday. Does look good. Your point about the culture and context in what food is eaten/enjoyed in is spot on. One good example is my favourite food programme – Anthony Bourdain's Cook's Tour or No Reservations. It's almost an anti-food programme; the food is always there in the background, but never the star. He gets under the skin of the people and places that he eats in, and gets carried away on it. That – almost above what the thing actually tastes like – is real food appreciation, real food tourism. I'll check the book out.